When Hugo, Matt and I sat down to plan this trip we pretty much prioritised the three items in the title of this blog entry (we also decided we wouldn’t be adverse to a cheeky beer or two). We got our fill of all of these along with drinking moonshine, visiting the home of blues music, seeing Elvis Pressley’s Graceland, relaxing on some amazing beaches and visiting a few tiny towns well off the tourist trail. Our tour took place back in June 2012 and over a few blog entries I’ll be writing about a few highlights and where we’d recommend to visit (and where to avoid). We kicked off the tour in Atlanta and the rest of the trip can be seen on the map below. “Hey boys. Welcome to Atlanta, enjoy a free shot on the house,” is surely the welcome you are looking for in any town after an eight hour flight and a two hour walk in 30 degree sun. We had stumbled across Blake’s bar whilst taking a stroll around Piedmont Park looking for our first beer in America. As soon as we walked in we were warmly welcomed by Duncan and all the other gents in there and given plenty of tips on what sites to enjoy in Atlanta and further afield. Both Matt and I told Duncan how we enjoyed the Kylie Minogue videos that were on the TV and I exclaimed how I loved Elton when told Mr John had recently frequented the bar. With such a warm welcome and several free shots we promised to come back the next day. The next evening I feel the mental fog of the flight and jet lag had significantly lifted and when we strolled back in to Blake’s, bold as day, we quickly realised what type of bar we had come across. Duncan was delighted to see that we had returned and quickly introduced us to many of his friends (it appeared word had spread that two “handsome” Brit guys were in town) and once again we were being given free shots and told which bars we would and would not “be welcome in” across the city. After talking to several guys in the bar and accepting a few of the *many* compliments coming our way we thought we should probably head on to explore a bit more of Atlanta, before more than genteel conversation was expected from us. I’m sure the welcome would have been just has warm, perhaps a little different, if we had not had the innocent misunderstanding and if you’re looking for a great bar, with chilled beers and a warm welcome then I heavily recommend Blake’s, we had a blast. Say hi to Duncan from us if you go in! On the first evening we ate at the Vortex Bar and Grill, a place that I will find hard to describe in a blog so I recommend watching this Man V Food extract to give you a taste of the type of place this is. Matt had the Coronary Bypass and I devoured the Texan Melt. We agreed that they zoomed straight in to the top three burgers we had ever eaten (mine had fried bread instead of a bun!!!). Along with a list of around 100 beers to choose from, and the total bill being less than £20 each, this place was pretty much heaven on earth. 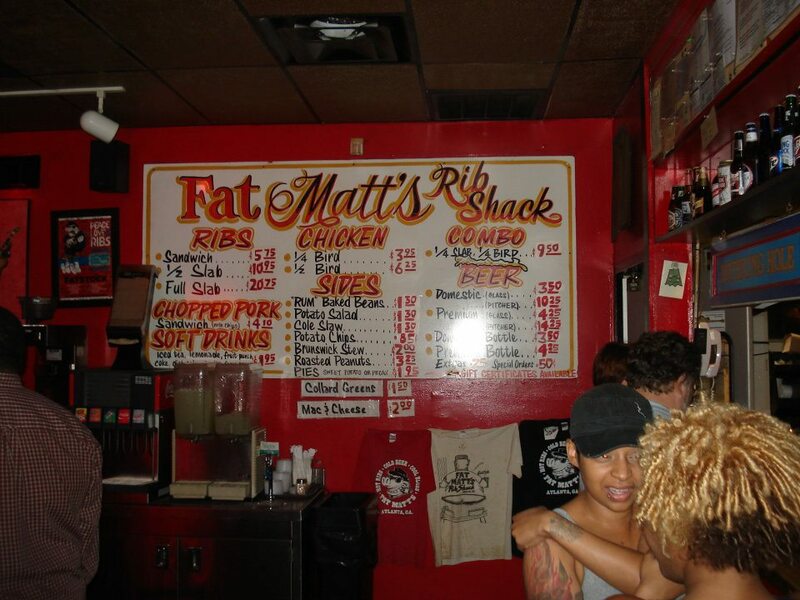 Fat Matt’s wall menu. Check out those prices! Other highlights in Atlanta included the CNN Tour (although it lost points for having Piers Morgan’s face plastered everywhere), Fat Matt’s Rib Shack (best ribs I’ve ever had, accompanied by a superb blues band) and the Olympic Park (great place to chill in a city nicknamed ‘Hotlanta’). I would avoid the World of Coca-Cola completely. It cost $16 to get in only to be told, endlessly, how amazing Coca-Cola is. As soon as they told us that they call vending machines “happiness machines” I knew I wanted my money back and by the time you get to the part where you can drink free coke you just want to get out. I was only expecting Atlanta to be the place we started and finished our trip but I thought it was a fantastic city with a lot of character. A great start to our tour of the deep south.